Clear skies this morning with good seeing! A spotless day but the proms are still visible at the NE limb. Another day with clear skies and average seeing. Whereas yesterday I could make out the faculae associated with AR2739, today the Sun was totally blank for spotless day 428 since solar max. However, the proms that could be seen at the NW limb yesterday showed up higher today as it seems to be turning from the far side of the sun towards the visible hemisphere. Clear skies after 3 days of clouds. 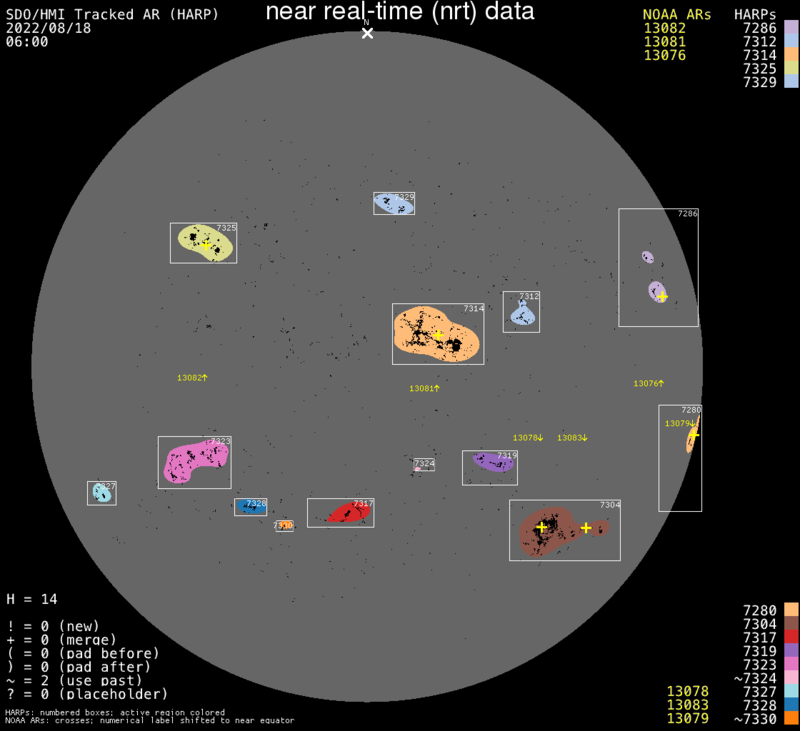 Seeing was below average and I had trouble focusing the full disk CaK run. AR2739 is still visible but AR2738 has rotated to the far side of the Sun. A few small filaments can be seen in the Northern hemisphere and some nice prominences are visible at the NE limb. Thin clouds covered the sky with below average seeing. AR2738 is getting closer to the Western limb and the light bridge still persists. In addition, a small new area seems to pop up. Will have to see how it develops. Also, we have some nice proms at the NE limb. 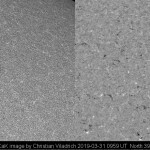 Today closeups as well as full disk images. Clear skies with good seeing for a change. AR2738 keeps tracking across the Sun towards the western limb. It’s size has been bobbling between 250 and 300 millionths. The light bridge still persists, and for the rest AR2738 remains stable. Full disk images today as well as close ups in the three wavelengths. Clear skies after yesterday’s storms. 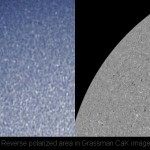 Seeing was bad because of the sidewall of the Jetstream with wind shears between the Sun and my scopes causing high scintillation. AR2738’s trailing spots have decayed but the leading spot is still well formed and the light bridge can still be seen. The area covers 250 millionths and one spot. Full disk images today and close ups of the region in the three wavelengths. Skies cleared a bit later today. AR2738’s trailing area seems to decay somewhat, but the leading spot does not seem to be very active. No flares yet today. The nice proms from yesterday have pretty much disappeared except for the NW limb. Full disk images today and close ups of the region in the three wavelengths. Clear Skies today!!! Seeing was great. AR2738 has increased to 300 millionths again and is a Cho area. It produced a B1.2 flare around 200 UT and a B2.0 around 500. I am glad that the seeing seems to be getting better with the jetstream shifting more North. Today Full disk images with the Ha showing the number of filaments around the disk and close ups of the active region. Had to image through moving clouds this morning which messed up my CaK images. We have a new active region AR2738 which just came around the eastern limb. In addition the remnants of AR2737 are still visible. 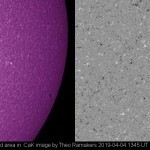 Today full disk images and close up in Ha and 540nm of AR2738.